The rooms at Dar Les Cigognes have all been designed with a maximum of guest comfort in mind, and each is uniquely decorated and showing its own character. There are three categories of rooms: Superior, Deluxe, and Suites. All rooms have independent climate control, high quality bed linens, and ensuite bathroom facilities. Please visit the photo gallery to see images of individual rooms. Some rooms may be twinned, ideal for those traveling together. There are three superior rooms. They can be twinned for people traveling together or twinned with a deluxe room. All superior rooms have King-sized beds. All have bath with shower. There are seven larger deluxe rooms, all with courtyard views. One of them can be twinned with a superior room for people travelling together. One has twin beds, the rest have King-sized beds. Most deluxe rooms have bath with shower as well as fireplaces. The Orientalist suite is our most sumptuous room. With a large 2 metre by 2 metre bed, separate sitting lounge with window onto the ramparts of the Palace and a fireplace, as well as a bathroom with separate bath and shower, the suite offers the best in luxury. 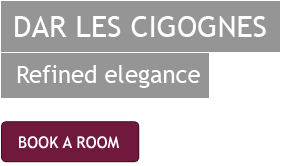 For more information about Dar Les Cigognes, please email us at info@lescigognes.com.